ATHENS – Greek Shipping Minister Panayiotis Kouroublis, whose Radical Left SYRIZA party didn’t want foreign investors, is jumping on the bandwagon praising them, lauding the Chinese company Cosco which took over the port of Piraeus with modernizing it. Prime Minister Alexis Tsipras is chasing more foreign businesses, especially those from China, as he reneged on promises to reverse privatizations he said were selling off state assets at fire sale prices, speeding the pace on orders of international creditors. Kouroublis, under fire last September over an oil slick when an unchecked tanker spilled content off Piraeus and onto beaches, heaped kudos on Cosco in an interview with the Chinese state news agency Xinhua. That came as the company was beginning new projects to upgrade Greece’s largest harbor where work had been stagnant for years and as international cruise ship companies are looking to bring in more vessels packed with tourists and were looking for better facilities. Work has started to upgrade the harbor ahead of the arrival of the new floating dock Piraeus III, at the end of February, in a project China Cosco Shipping, launched last June, Greek national news agency ANA-MPA reported. Since China Cosco Shipping acquired a majority stake in Piraeus Port Authority (OLP) and took over the management in 2016 after winning an international tender, the image of the harbor has been changing rapidly and for the better despite protests from Greek workers who didn’t want it changing hands. The new works include dredging the harbor to create up to 20 meters of operating depth, providing new electricity and water supply networks, and installing four mooring buoys for anchoring ships. The new floating repair dock – 240 meters (780.7 feet) long, 45 meters (147.63 feet) wide, 22,000 tons lifting capacity and full crane equipment – will be able to service ships with a capacity of 80,000 tons. 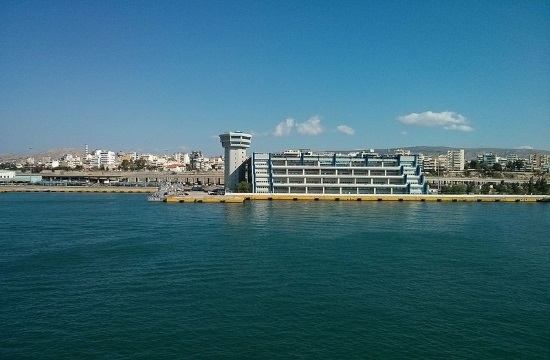 “The projects that have started at Perama and will proceed with the lifting of two wrecks off Pier II by the Shipping Ministry, so that the infrastructure for the installation of PPA’s large floating dock can be created, show how smoothly the cooperation of the Greek government with the investors is progressing,” Kouroublis said. “They also show that the Shipping Ministry’s policy will continue to facilitate any development activity stemming from Cosco’s contractual obligations regarding bureaucracy and other obstacles,” the Greek official told Xinhua. “At the same time, we support workers’ rights by welcoming the latest agreement between employees and the OLP for the signing of a Collective Labor Agreement,” the minister said, ironically as the government is trying to limit the rights of Greek workers and bar strikes. Tsipras’ partner, Betty Baziana, also in an interview with a left-wing newspaper said that private workers have no merit because they are working for personal profit and not the common good. Shipping officials have said that ships will no longer need to carry out repair and maintenance operations in other Mediterranean shipyards, while this move is also expected to create new jobs in the Greek market. Speaking to Xinhua, George Koumpenas, Vice President of Operations at Celestyal Cruises, said the works will help significantly for his industry and Greek shipbuilders, with Greek shipping companies dominating the world’s waves. “In recent years, due to a lack of suitable dock sizes, companies have been obliged to dock our vessels to neighboring countries such as Malta, Turkey and Croatia. This has resulted in the loss of significant revenues for the national economy,” he explained. “The installation and operation of a large floating dock will help maintain and develop the shipbuilding industry in the wider Piraeus and Perama areas, as an important criterion for the choice of the port for seafaring companies is the ability to make repairs,” Koumpenas told the news agency.